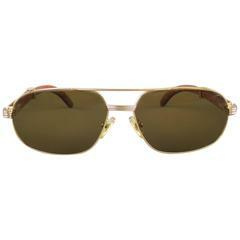 New Cartier Serrano unique rimless sunglasses with brown cartier (uv protection) lenses. 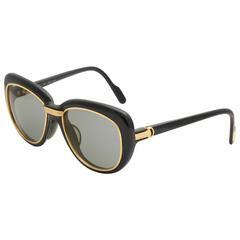 Frame with the front and sides in gold. All hallmarks. Cartier gold signs on the black ear paddles. These are like a pair of jewels on your nose. Beautiful design and a real sign of the times. Amazing red leather original Cartier box. 1990's designed and produced. 55mm large size.